Visual, 18.25” x 19.5” approx. 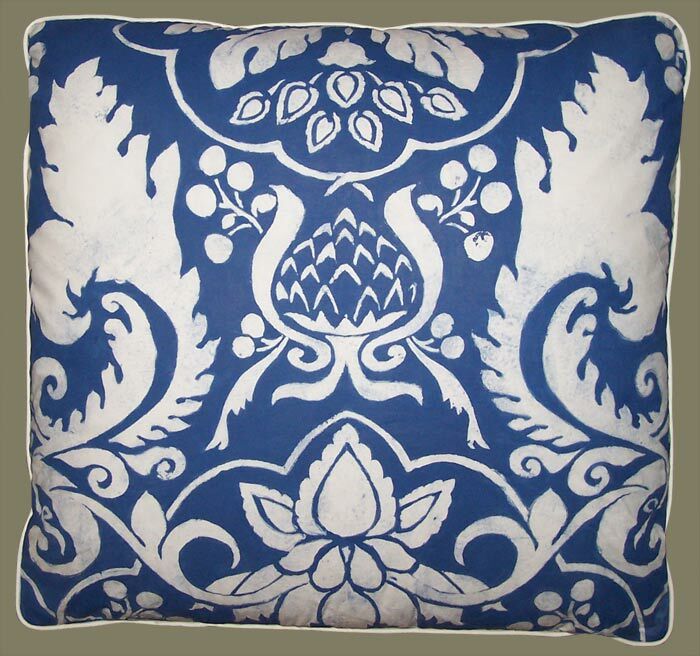 Description: An Artisanaware Decorative Throw Pillow in Classic Blue and White. An Original Hand Stenciled Surface Design in a Damask Like Floral Motif is Created by a Process Using a Cornstarch Paste Dabbed Through a Cut Stencil and Left to Dry. This Paste Acts as a Resist to the Blue Pigment Later Brushed Over the Pattern in a Painterly, Mottled Fashion. The Cornstarch is Then Removed, Exposing the Positive Elements of the Design in White. A Very Involved Process, Akin to Wax Resist Batik. This Hand Painted Pillow Done on Fine Weave White Cotton Cambric Fabric, has a Crisp, Chintz Like Quality. The Pillow Back has also been Hand Painted in Blue. This Treatment has Resulted in a Light Hearted Accent Pillow with a Casual Flair. All was Designed and Created in the Artisanaworks Studio by Carol Tate. High End, Feather/Down Insert, Hand Stitched Closure and Self Welt. Though a One of a Kind Pillow, a Very Similar Companion Pillow With Slightly Different Dimensions and Print Results is Available. Experiment with Print and Pattern Mixing by Combining with Blue and White Pillow A, as well as Coordinating Stripe Pillow Covers, Paisley Wooden Block Print and ChenilleWindow Pane Check Covers in Blue and White.